Fall is here, which means it’s time to run through a car maintenance checklist to ensure you’re ready for the new season. Having your car inspected during autumn months might feel like a chore, but it will save you a headache when temperatures drop, winter hits and you realize you might need a set of new tires or new brakes. Here are six tune-up and preventative maintenance tips to prepare your car for fall. Have you ever had a car battery drain during the winter? It’s a common occurrence. In colder months, vehicle batteries experience heavier wear-and-tear than during spring and summer. The cold increases the chance of battery drainage. But a quick check and battery replacement, if necessary, will make sure you won’t be stranded with a dead battery as temperatures drop. Nobody wants to drive a freezing vehicle. It’s uncomfortable and unsafe. So make sure you check that your heater works properly before cold weather hits. Checking the defroster is equally as crucial, too — don’t wait until the dead of winter when you get up for work and the morning frost won’t clear from your windshield. If you’re low or out of any of these, replace them as soon as possible. Make sure your wipers work properly, and especially with frigid New England winters, consider using more durable winter wiper blades. Be sure to use cold-weather washer fluid, too. Next, all exterior and interior lights should be checked. Make sure they work and that headlights are properly aimed. Ensure each of these systems are up-to-date. If anything is broken, leaking, damaged or making unusual noises, you know it’s time for a professional to take a look. Checking tires is extremely important heading into colder weather. How are the tread and tire pressure holding up? If there is uneven wear, you may need a wheelalignment. Any bulges and bald spots could be indications that you need to replace tires, which should be done before winter. Ready for your autumn tune-up? Cut the stress of figuring it out on your own. 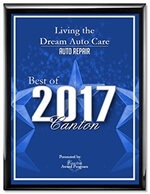 The team atLiving the Dream Auto Care is here to handle your car maintenance checklist!